Juicing is one of the best ways to lose weight successfully. There are many fruits and vegetables that you can include in your diet, that can help you get rid of those extra pounds. All the insoluble fiber from beets are extracted during the juicing process. But the soluble fiber is preserved, which is half the total dietary fiber content. You can also combine the extracted fiber with your fresh juice to get the full 3.8 grams of dietary fiber. Then you can add 1/2 cup of water to thin out the texture. Dietary fiber helps increase the bulk in your diet, which helps you feel fuller with less food, leading to a lower calorie intake, thus helping with weight loss. A regular serving of beet juice contains 5% to 7.6% of the recommended intake of dietary fiber. 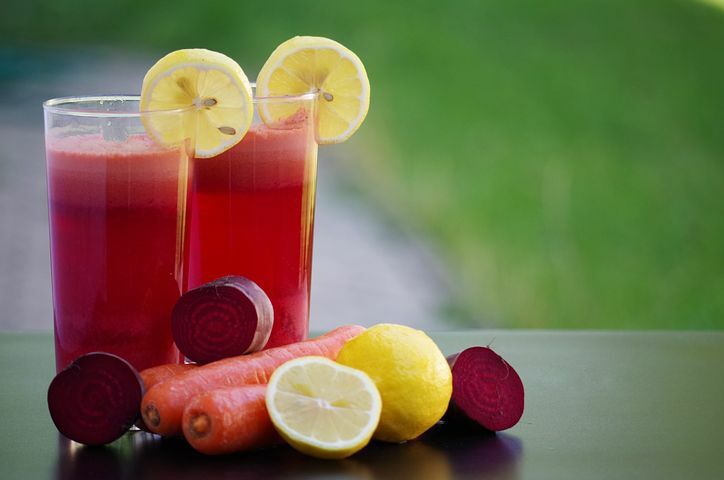 Beet juice with the added fiber will provide at least 10% to 15%. Carrots contain thick layers of cellulose on its cell walls, which prevent your body from fully absorbing and digesting the minerals and vitamins in these vegetables. When you juice carrots, these cell walls break down. Although juicing makes carrot juice more nutrient-dense, compared to raw carrots, carrot juice is still low in calories and fat. It is also high in minerals and vitamins which makes carrot juice a good addition to any weight loss program. When you juice fresh cucumbers it gives you the dietary fiber content of the vegetable, which makes it an even more nutritious beverage. One cup serving of sliced cucumber that is blended with 1/2 cup of water will make a one cup serving of cucumber juice. Cucumbers are a crunchy and refreshing topping for a salad. It can be made into a healthy juice that will fit into your weight-loss plan. Ginger is ideal for weight loss because of its properties, which are perfect to help you burn fat. Ginger juice works in helping you lose weight as it has a highly satiating effect. It helps as a natural appetite suppressant that will fight off the feeling of hunger in between meals. It also contains fat-burning properties which makes your metabolism accelerate and therefore burn more fat. Lemon juice is the missing link between you and your ideal weight. While there are a number of weight-loss benefits surrounding lemon, which includes regulating sugar absorption to melting the fat away, there is not enough studies to support them. But lemon juice provides other benefits that might be useful when you are trying to lose weight. You can have lemon honey concoction in the morning on an empty stomach or drink it in the form of lemonade. Watermelon is one of the inexpensive way to help you lose weight and cleanse your body as well. Just one cup serving of watermelon contains only 47 calories. Watermelon contains 92% water and the remaining 8% is filled with healthy nutrients and other amazing health benefits. It is high in dietary fiber, which helps keep the colon clean and helps cleanse the body. Hey, very nice article. I came across this on Google, and I am stoked that I did. I will definitely be coming back here more often. Wish I could add to the conversation and bring a bit more to the table, but am just taking in as much info as I can at the moment. Thanks for sharing.